Marriage is much on my mind of late, as it should be with tomorrow's 25th anniversary of our own nuptials. On Saturday, we rode the stately and elegant MV Commander up into the Hudson Highlands, as we did a quarter century ago in that summer of 1986. Farther in in Albany, of course, the definition of legal wedlock was shifting - frankly, something that would have not been imaginable in the 80s. And while laurels for political bravery are rightly laid on the noggins of Governor Cuomo (whose father held the State House when the Artist and I tied the knot) and the legislators who crossed the aisle, but I think it's also important to credit a movement for gay rights that grew every broader and more organized. From my vantage point (which is partly formed by the factors of my age and work), this is the story of classic long-tail organizing - and of the successful evolution of a tenacious movement. Forged not so much by the Stonewall riots as by the scourge of the AIDS epidemic, the coalition was once narrow, angry and poorly focused. Yet it grew, in savvy and professionalism - and it also surfed the breaking waves of real societal evolution, the demographic shift to a younger generation that lacked ingrained prejudice against homosexuality. I'm filled with joy at this development - for my gay and lesbian friends, certainly. But also for New York, and for society. This is real change; the dying embers of a legalized prejudice hissing in a final smoking spark. Sure, there will be a reaction. "For every person who said after Friday night’s vote, “Hooray” or “Thank God” or “It’s about time”, there was at least one person screaming in rage," noted Lance Mannion, and he's right. But here's a prediction: New York's sheer audacity as a big state - the Empire State - will help to normalize this broadened American view of marriage. As James Wolcott wrote, "it is a victory for fairness, equality, tolerance, enlightenment, conscience and integrity." And as I rode the Commander into the Highlands with my bride of 25 years, whose flashing eyes stir my soul even now (no, especially now), I thought a fine thought: 25 years from now, some other New Yorkers will be celebrating their silver anniversary. The annual Personal Democracy Forum unfurls its banner of Internet freedom and open digital communications this week at NYU, convening transparency geeks and "we-government" advocates from around the world for two days of wifi-powered gab and jab. I'll be there and look forward to the immersion in the networks and back-channels that powered, for example, the recent uprisings in North Africa and the Middle East. In an interesting post on his Buzz Machine blog, one of PDF's perennial voices, Jeff Jarvis, sagely scrapes the wired government question to its core: sovereignty. To what extent can governments, elected and otherwise, yield power and legal oversight - and indeed, public citizen participation itself - to the borderless, socially-networked digital polity? The e-G8 was government’s opening volley against the internet as its agent of disruption. Oh, yes, the gathering was positioned as exactly the opposite: We come in peace, said Nicolas Sarkozy. After hearing him speak to the thousand net, corporate, technology, and government machers he’d assembled in Tuileries tents, I tweeted that I felt like a native of the Americas or Africa watching colonists’ ships sail in, thinking, this can’t end well. I rewatched Sarkozy’s welcoming address and heard him alternately begging to be invited to the cool kids’ party–and warning them of trouble if he isn’t. “As long as the internet is part and parcel of the daily lives of our citizens, it would be a contradiction to leave government out of this massive discussion,” he said. Then he asserted: “No one should forget that governments in our democracies are the only legitimate representatives of their citizens.” Really, Mr. President? Tell that to the people of Tahrir Square. The citizens of Egypt found their true voice apart from the government of their so-called democracy. Spring is not only overtaking the Middle East. In Spain, too, citizens are speaking for themselves, because they can. Where else will it spread? Jeff didn't drop in the reference to the Tuileries lightly - it's pretty easy to cast a scripted old-school pol like Sarkozy as a modern Louis XVI, defensively awaiting the mobs in his garden, and he's quite right about the connected nature of the Tahrir Square crowds. But there are two aspects of the Jarvis post that I might take issue with. The first relates to style and culture, to the idea so resident among - well - tech machers that they're the beans on the vines of the rest of the world's population. They are not. Indeed, "tech cool" has become such a mass consumer brand proposition - the linked sans serif world of Apple and Google and Twitter - that there's no exclusivity at all, hence no "cool kids party." Take it from someone who wrote that "the big boys don't get it" in one of the early proto-blogs in 1995 that the big boys do indeed get it - indeed the big boys are it (more on this in a moment). Techno-hip is the default culture, not the province of the vanguard. Google is Wal-Mart, Apple is McDonald's, Twitter is Target and Facebook really is your father's Oldsmobile. Yet the idea of an elite persists, even in the hallways of PDF, where organizers Micah Sifry and Andrew Rasiej go to long lengths to ensure a broad, diverse and grounded level of discourse. In part, it relates to the anti-government attitude so prevalent in Silicon Valley, where "self-regulation" in industry is not greeted with the peals of laughter the concept receives in the rest of the world. The great new social networks we rightly celebrate for their role in democratic movements are themselves controlled by a corporate few. For better or worse, our technology industry does think of itself as undeserving of intervention by the elected representatives of the citizenry and has often attempted to set up its own governance. So when Jarvis sets up Sarkozy as an old dude grasping for membership in the "cool kids" club, he's positioning democratic heads of of state outside the digital elite - which in fairness to Jeff, doesn't just mean the big business CEOs, venture capitalists, and A-list digerati but also the new leaders on the world stage using connected technologies to build movements. Yet here's the rub: there should be no digital elite if this thing goes the way we'd all like it to go. Not in Egypt or Tunisia. Not in Silicon Valley. Not in Foggy Bottom. Not under house arrest in Norfolk, England. Certainly not among the anarchist hackers who attack privacy and speech. I have no interest in creating a new power structure defined by control over digital assets and audiences. And that's my second point: I refuse to yield my rights as a citizen of the United States to any digital plebiscite, or any appointed committee of self-appointed "industry leaders" ... or to lay down for the bullying wired brownshirts for that matter. Sarkozy's point about democratic governments being "the only legitimate representatives of their citizens" was clumsily expressed. It implies a yolk of obedience to the state, while ignoring the vital concept of civic duty that has always been at the core of Jeffersonian democratic principles. That is to say simply: democracy is, and should be, a two-way street. Despite the failings of American government and political leaders - a constant since the founding of the Republic - that push and pull still exists, in my view. And it defines legitimacy and undergirds sovereignty. The rise of networks, while an annoyance to those in power at times, should actually work to legitimize elected government by connecting groups of citizens and lessening the distance between the government and the governed. Those who believe in democracy online, and the strong worth of social media tools in both demanding representation and strengthening its every day expression, should recoil at the shenanigans of some who posture to attack the legitimacy of the elected - whether it's the Tea Party, the hard-core followers of WikiLeaks, or the digitial mobs who threaten cyber-death to any who disagree with their ever-changing demands and manifestos. The argument that the Internet comprises a new borderless polity is strong one. Jeff Jarvis argues: "many of us — net people — have a new loyalty that inevitably undercuts old, national authority." Yet in that brave new world, where do I vote? Whom can I impeach? And where are my rights when the principles of Jefferson and the ideals of Emerson lay trampled in the digital gutter in a virtual world where coding might equals moral right? That "tense transition" is what I'm hoping to hear more about at NYU this week. In a post previewing PDF, Micah Sifry wrote that he was looking forward to hearing Tunisian activist Sami Ben Gharbia of Nawaat.org and Global Voices - and points to his long essay on digital activism in the Arab world. The essay is startling, but perhaps it shouldn't be. In arguing that nascent democratic movements in the Middle East and North Africa need, more than anything else, their independence from the influence of western governments and NGOs, Ben Gharbia is mirroring an American ideal, even while opposing American influence - and his goal is to "prevent digital activism in the Arab world from losing its most genuine and cherished characteristic which is its autonomy." 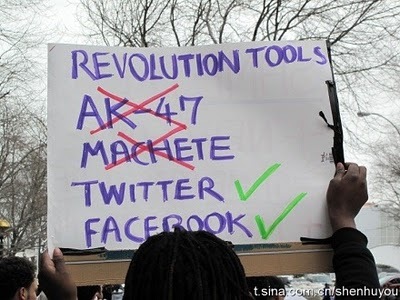 While it may look easy to grasp, digital activism is a complex multi-faceted movement, varies strongly from one country to another, and changes over the course of time. It’s always evolving by adopting new tools and tactics and through a constant adjustment of its strategies of resistance and actions. Caught in the middle between authoritarian regimes aggressively engaged in repression, Internet filtering and monitoring on the one side, and growing attention from Western public agencies and associated NGOs on the other, digital activists and online free speech advocates in the Arab world are going through one of the most challenging phases of their short history that could alter their ecosystem dramatically. That challenge is theirs, as it should be. There is no "8th continent" or new government of the Internet. There are lands and there are peoples and there are myriad interlocked cultures. If you would not challenge the hard-won rights and sovereignty of a Northern African democratic movement in its infancy, please don't challenge mine. After all, thanks to the ever-growing growing network of networks, my democracy grows more responsive and transparent daily....doesn't it?